Author: Meaghan Morris, M.D., Ph.D.
Senior Author: Fausto J. Rodriguez, M.D. Cite this page: Morris M, Rodriguez FJ. Glioblastoma, IDH mutant. PathologyOutlines.com website. 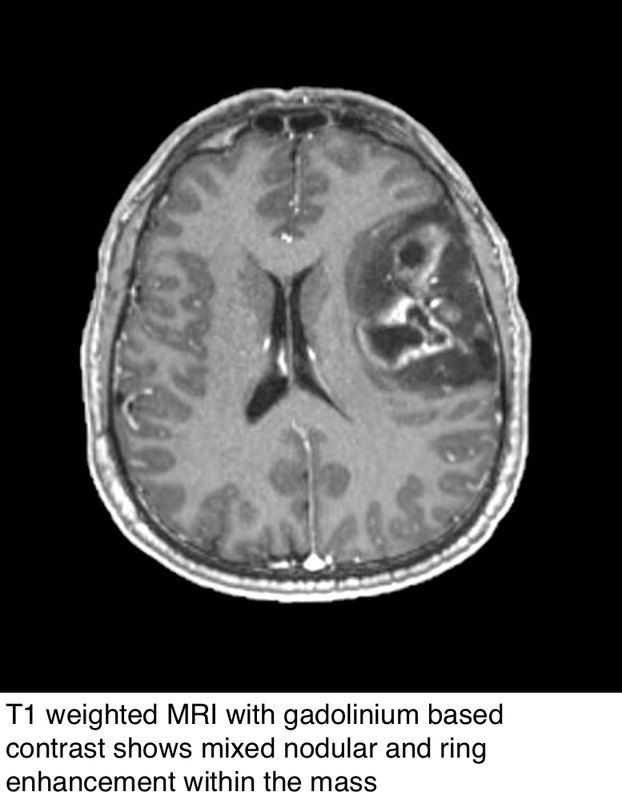 http://www.pathologyoutlines.com/topic/cnstumorglioblastomaidhmutant.html. Accessed April 25th, 2019. Contributed by Meaghan Morris, M.D., Ph.D.
A 40 year old woman presents with an infiltrative frontal lobe mass with nodular enhancement on MRI. She has a history of a diffuse astrocytoma 5 years prior. 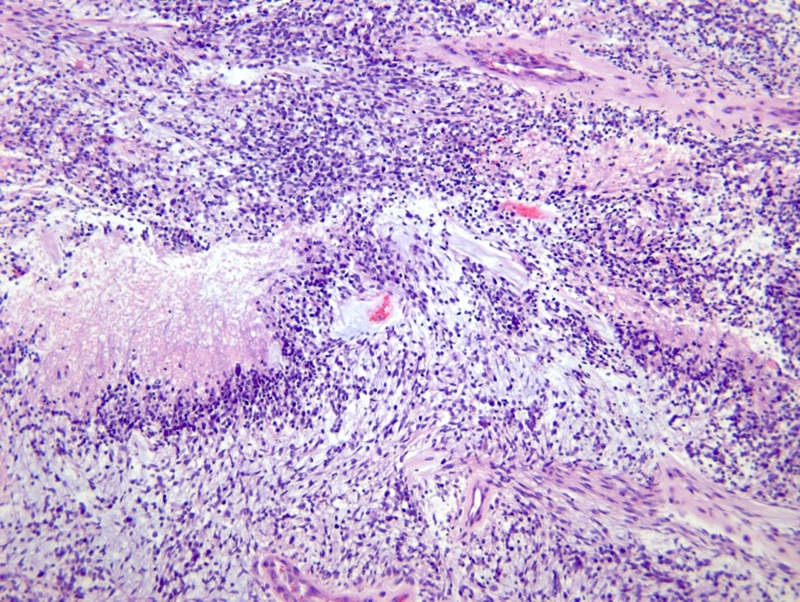 The surgical resection shows an infiltrative neoplasm with abundant fibrillary processes and pseudopallisading necrosis. What enzyme is likely to be mutated in this tumor? B. Isocitrate dehydrogenase 1 (IDH1). 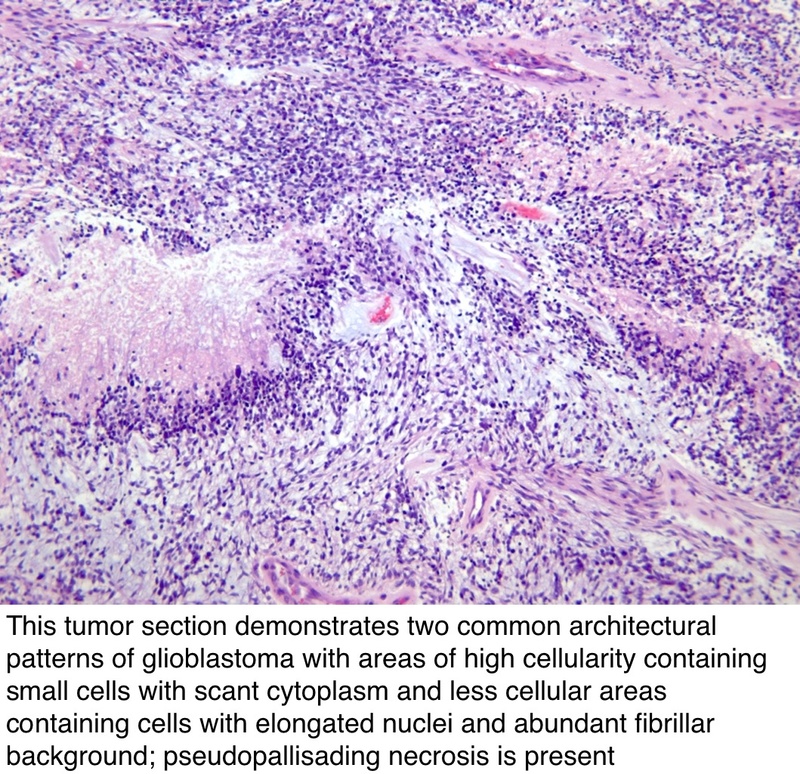 The histology shows glioblastoma, which is arising from a diffuse astrocytoma in this clinical scenario. 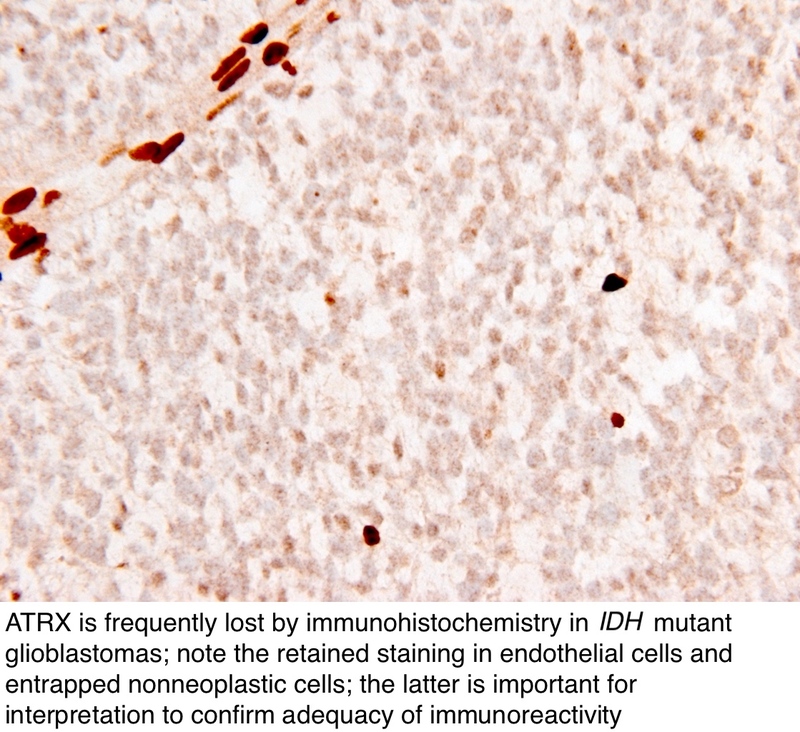 IDH1 mutations are frequent in glioblastomas arising from diffuse astrocytomas and tend to present in the frontal lobe of patients in their fifth decade of life. 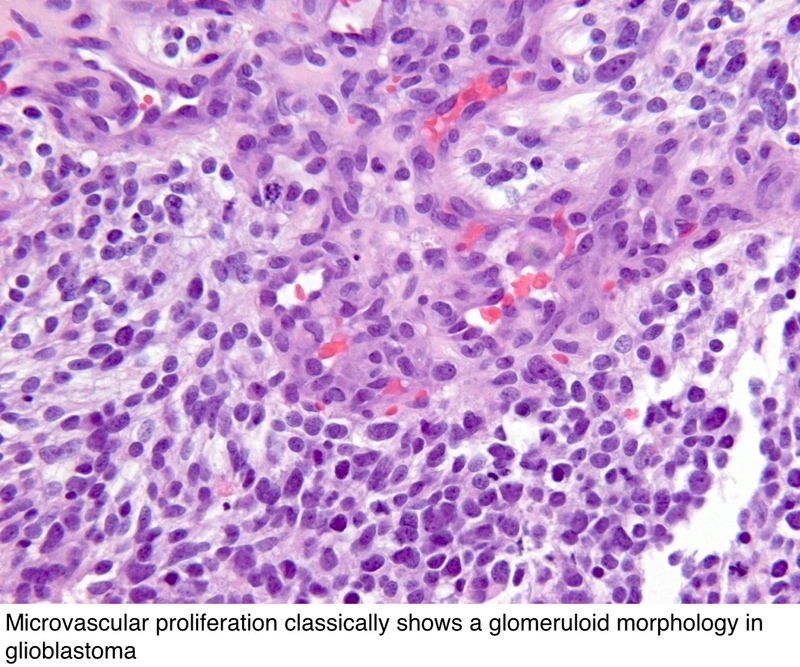 SDH mutations are found in pheochromocytomas but are not associated with glioblastoma. 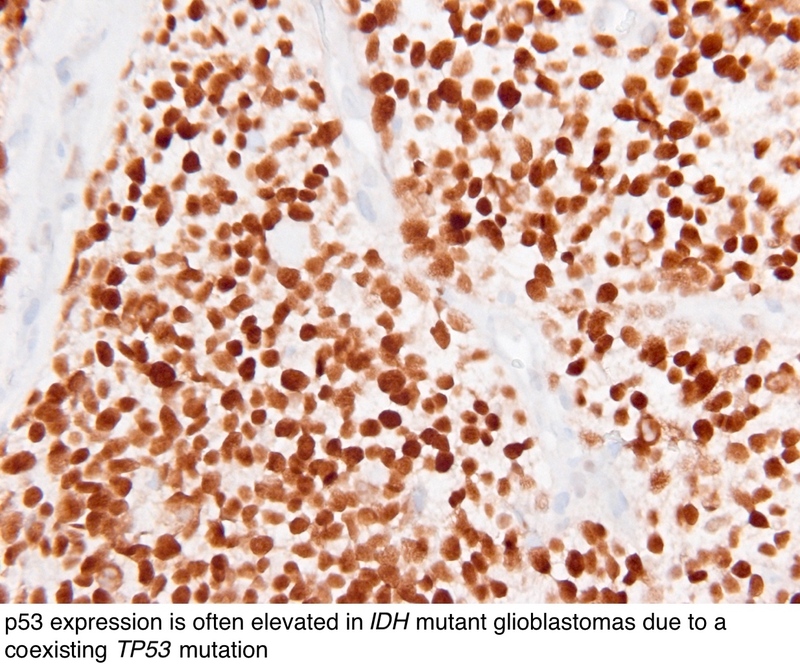 LDH mutations are not associated with glioblastoma. 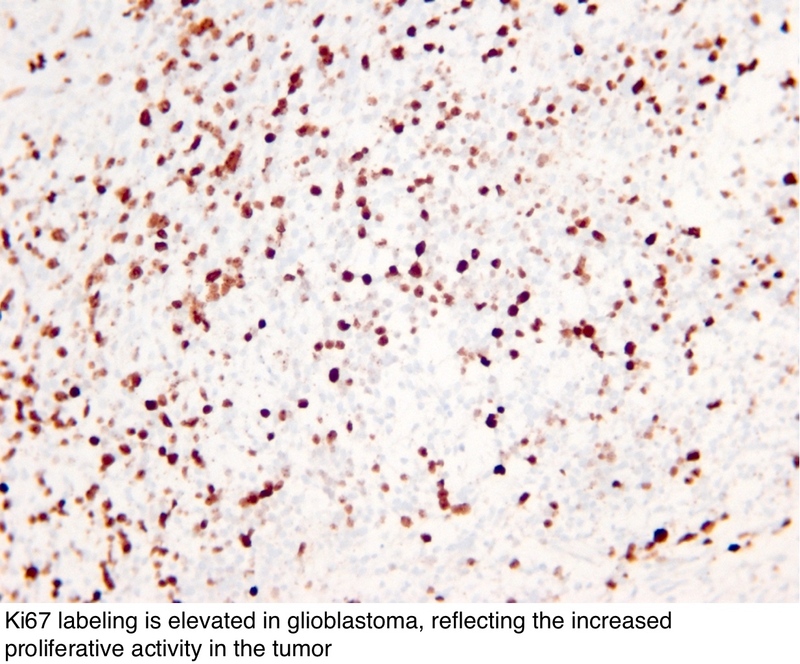 SMARCB1 / INI1 mutations with loss of INI1 labeling by immunohistochemistry are associated with atypical teratoid / rhabdoid tumors but are not associated with glioblastoma. 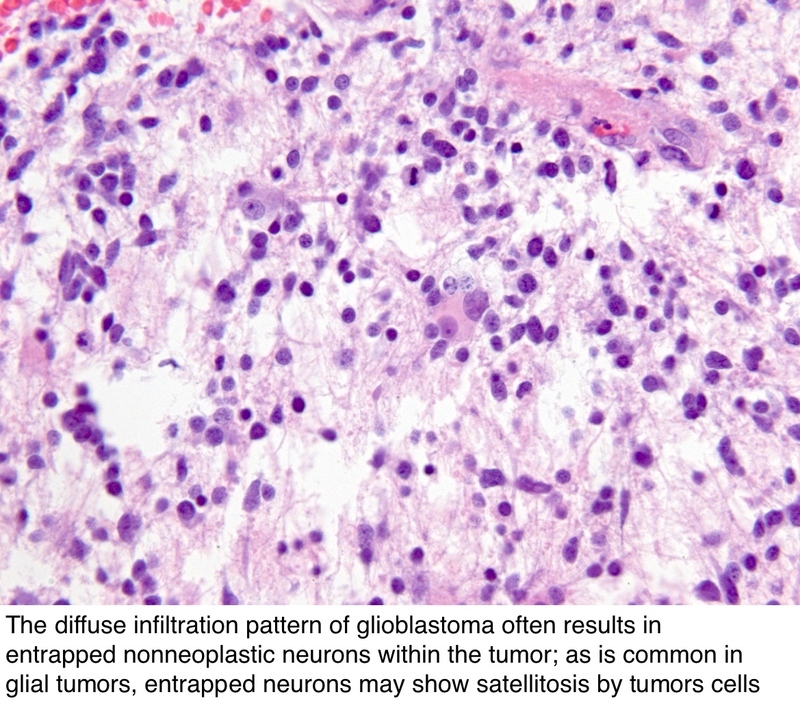 Mutations in BRAF are found in multiple types of CNS tumors, including epithelioid glioblastoma, but are not associated with glioblastoma arising from a diffuse astrocytoma. B. Improved prognosis. 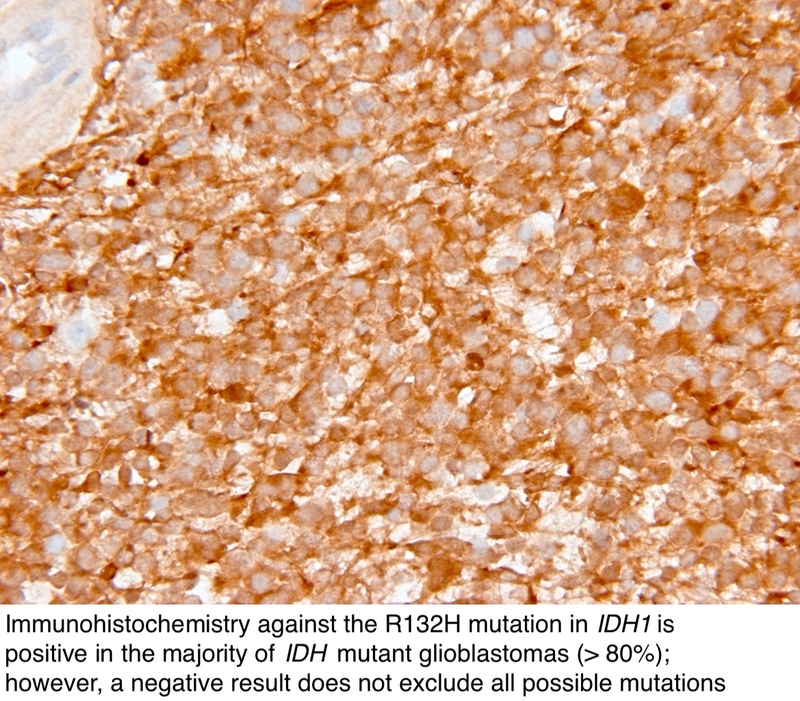 IDH mutation in glioblastomas is associated with an improved prognosis compared with IDH wildtype glioblastomas. 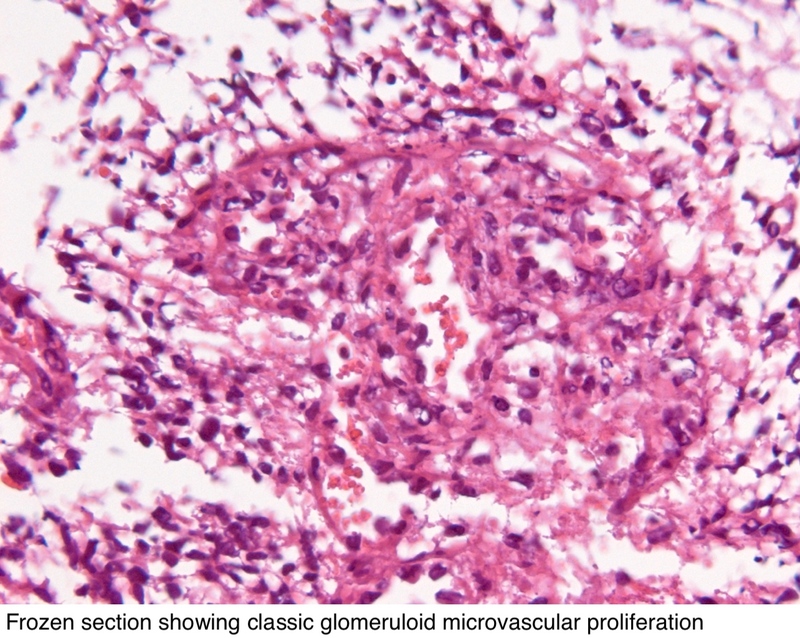 IDH mutant glioblastomas occur predominantly in the frontal lobe of adults with a mean onset in the fifth decade. 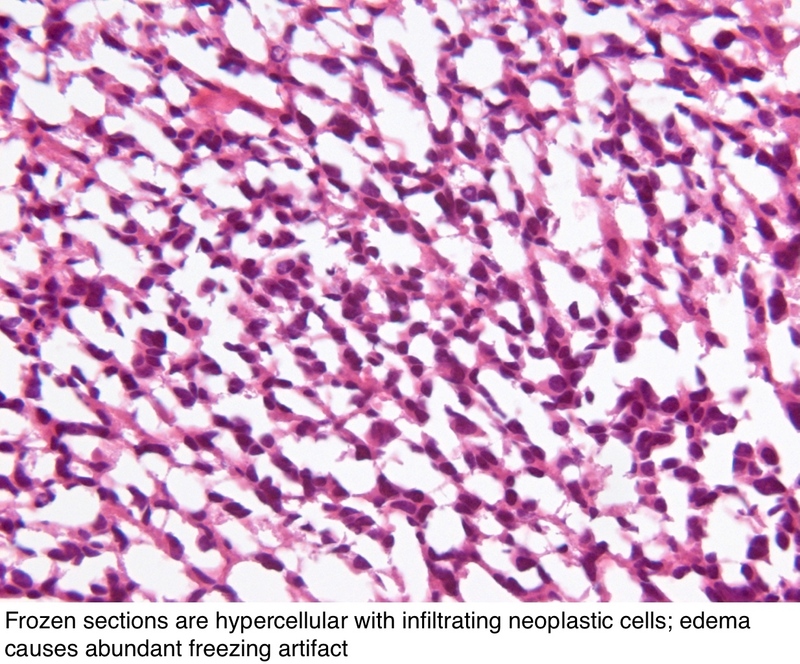 Onset in the seventh decade is typical of IDH wildtype glioblastoma. 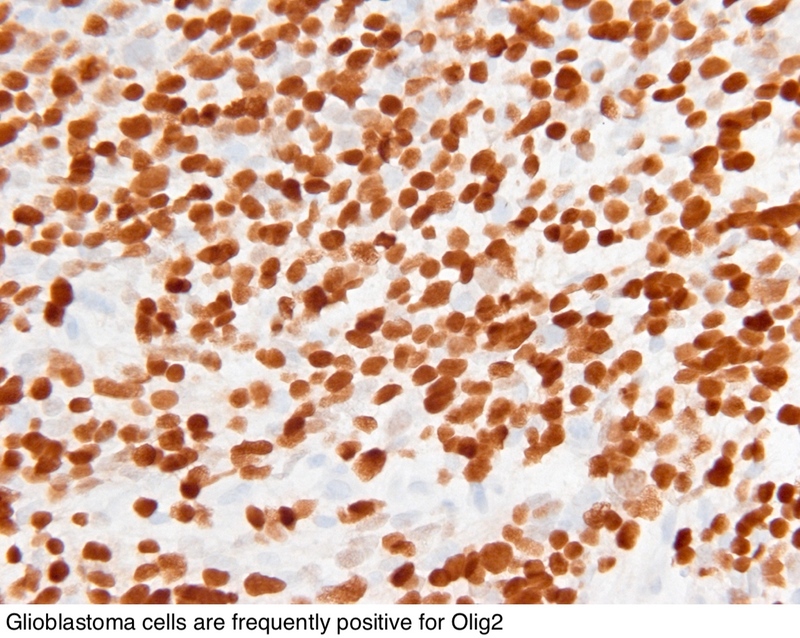 High grade brainstem gliomas in children are associated with the K27M mutation of histone H3. 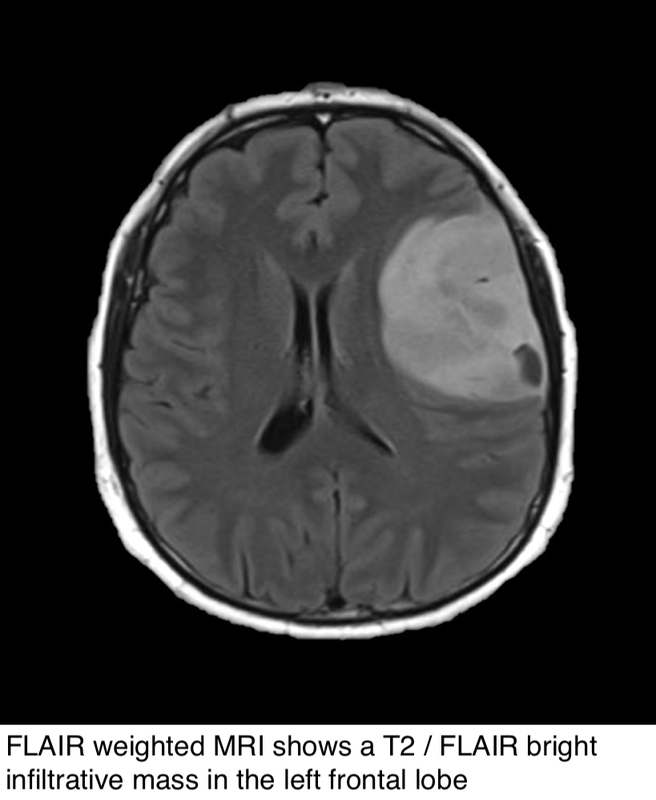 Mismatch repair deficiency syndrome is associated with an increased risk of glioblastoma but is not associated with IDH mutation. IDH mutant glioblastomas are not known to be less responsive to therapy than IDH wildtype glioblastomas.